Offer quad-channel capture with dual-channel playback. Support HDMI or SDI signals. 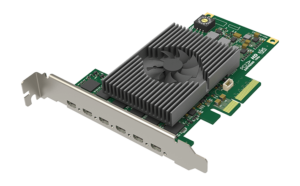 Building on Magewell’s hallmarks of superior quality, reliability and feature-richness, the Flex I/O series extends the benefits of the company’s popular capture devices to output and playout applications while filling a market need for high-performance, easy-to-use output cards at affordable pricing. 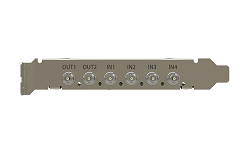 Combining outstanding channel density with exceptional flexibility, the first two Flex I/O models each feature four input channels and two outputs. 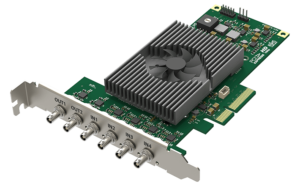 Setting the Flex I/O family apart from other interface cards, all inputs and outputs can be used simultaneously with independently differing resolutions, frame rates and processing settings. Each input channel can also be routed to multiple software applications in parallel, enabling concurrent tasks such as live streaming, recording and playout, all from a single card.